Ipswich, Massachusetts couple on a bicycle for two. The American popularity of bicycles originated in Boston, which held the first U.S. bicycle race on May 24, 1878. 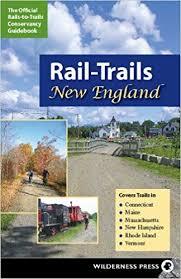 In 1883, Abbot Bassett of Chelsea set out on the first recorded 100 mile bike ride, meandering on an adult tricycle along the North Shore to Ipswich and back home. In 1886 Boston businessman Pope introduced the Columbia Safety, a modern two wheel “safety” bicycle, priced at over $100 apiece, which enabled a cyclist from Newton to ride round-trip to Ipswich on the Newburyport Turnpike (Rt. 1) in 9 hours 50 minutes, setting a new record for a 100 mile ride. Pope advertised his bikes in a Boston publication called “The Wheelmen” and by 1890 the city had became the home of “Bicycle Fever”. The bicycle was a freedom machine, enabling people who had never traveled far from home to ride dozens of miles in a day. Bicyclists filled the roads, wearing their finest cycling clothes while perched on the status symbol of the era. The bicycle was the fastest vehicle on the road, and The Boston Daily Globe began promoting races and social events throughout the area. In 1909 Ernest Currier demolished a house at 46 South Main Street to build the town’s first bicycle shop, where he also repaired “horseless carriages.” The town’s first automobile dealership opened up next door in 1922 in the building that now houses Jungle Printing. 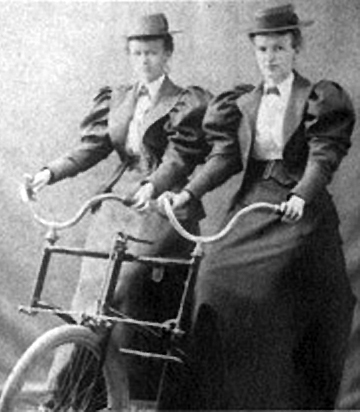 The photograph on the right (courtesy of the Ipswich Historical Society) shows sisters Flora and Susie Baker on a “Sociable”, a two-wheeled tandem bike with side-by-side seats and handlebars, convenient for courting (if you survived). North Shore tricycle tours took women to Gloucester, Ipswich, Essex and Newburyport accompanied by men on bicycles or together on tandem tricycles. Despite enduring public rage, women began riding from home to work, and by the mid 1890’s two million American women owned or used bicycles. Boston’s Mary Sargent Hopkins (aka “Merrie Wheeler”) published a women-specific cycling magazine, The Wheelwoman, expounding cycling as an element of social reform and physical well being, and in 1895, Boston’s Annie Londonderry became the first woman to bicycle around the world.